Ready to seek some solitude? Find a vacation spot with a great view, peace & quiet? Be BEARLY SEEN? You'll find it here when staying in this incredible view cabin located in the gated Shagbark resort community. BEARLY SEEN is a beautful two level log cabin with 2 King master suites - each with its own attached bath and corner Jacuzzi tub. 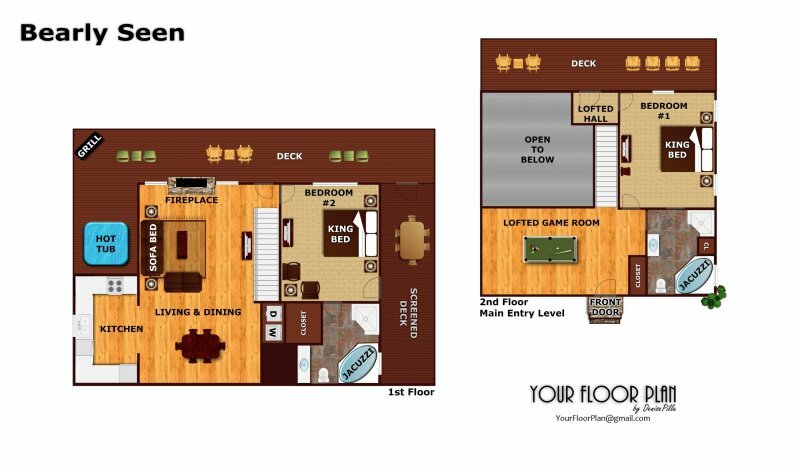 Enter from level parking into a vaulted game room with pool table. Downstairs a tall vaulted living room includes a floor to ceiling stone / gas fireplace, LED TV. The living opens past the dining area for 6 into a custom kitchen, ideal for cooking up those favorite vacation recipes! Outside two levels of decks, including a large screened porch make outside living enjoyable. Big mountain views can be enjoyed from both levels of this log home. Escape for your vacation this year and be BEARLY SEEN! Call today to reserve your Smoky Mountain getaway! Loved the cabin. Everything was perfect !! This was our second year using APG and was just as pleased as we were last year! We will continue to use APG in the years to come and try new cabins! Thanks for making our experience enjoyable and such a simple process! We had a great stay! Cabin was just what we hoped. Very clean and beautiful. We&#39;ll be back. This was our first time using Patriots Getaways service.They did a great job communicating and made the process easy.The cabin was perfect for our family.We will stay again! Everyone enjoyed the stay. We have stayed with APG for close to 8 yrs, over twenty times. This was probably the most beautiful and had the best quality furnishings. We definitely stay here again. Had a great thanksgiving me. Cabin was very clean and well organized. Would love to stay here again! We will definitely be booking through American patriot in the future. We also want to come back to the same cabin. We loved it and the staff at the shagbark resport were very helpful when we had a vehicle fire upon entereing. Overall the stay was amazing.The views were amazing. And we got engaged while there! Perfect! This was our second year booking through American Patriot Getaway, what a fantastic experience!! We highly recommend them! Our cabin Bearly Seen was amazing. It had everything we needed, including serenity away from the daily hustle and bustle. Excellentexperience!!! The Bearly Seen cabin was the best! It was exceptionally clean, well equipped and had great TV. I loved the view of the mountains with the sound of water below. The water sound turned out to be a waterfall. The only thing that could improve was to havethe AC set lower so the upper level would be cooler upon arrival. There are great porches with seating to take in the scenery. I definitely want to stay at this cabin again!